What would be possible if your leaders felt they were able to express themselves fully? What could that mean for growth, for innovation, for engagement in your organisation? When we talk about fear in leadership, so often it is with reference to the imposition of fear from above, often a domineering CEO using fear as a tool of control. 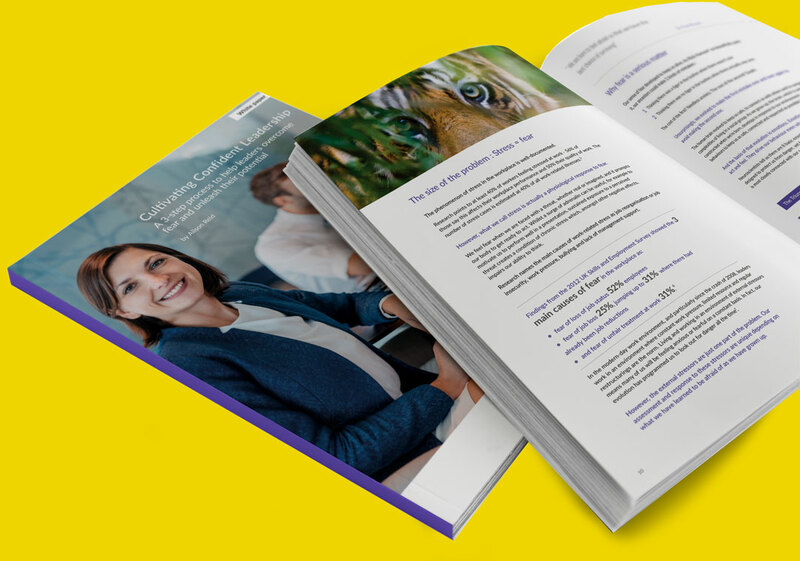 However, this white paper is not about how leaders use fear on others, but how fear holds leaders back from realising their full potential and helping your organisation thrive. I have coached many talented senior managers and directors in large complex organisations cross-sector facing a new leadership challenge. Their line managers are wondering why they’re not stepping up – they want them to be more visible, more vocal and more confident. Why don’t they just get on with it? Underlying fears are holding these individuals back from performing at their best – fear of being found out, fear of rejection, fear of failure. The increased challenge and exposure that comes with leadership means the strategies that helped them succeed as managers no longer work. Yet only a minority of leaders experiencing fear voice their concerns. When fear is at play, survival becomes paramount – pleasing the boss becomes more important than taking the lead. Not good news when CEOS are concerned that their emerging leaders lack the ability to think strategically and believe creativity is crucial for future leadership. 40% of employees feel stressed at work in an environment where constant work pressure, limited resource and regular restructurings are the norm. Research shows they’re afraid of losing their status, losing their job, and of unfair treatment at work. Yet our response to external stressors depends on what we’ve learned to be afraid of. Fear has shaped our survival strategies whether that’s people-pleasing or procrastination. If you’d like to find out more about working with Alison, please put your details in the boxes below and Alison will be in touch. Right from the start of our work together, Alison helped me extend my horizons. Coaching with her gave me the confidence to take several important steps and exceed goals originally set by my manager. This led to my promotion to Director within 9 months and a new assignment to lead and build a new organisation. Over the past year, I’ve been setting up my stall as a speaker to share my messages with more people and grow my leadership and career coaching practice. I’ve done alot of training, facilitating and presenting in my time, but I’ve found that speaking is a whole different ball-game. Why is that, when they all involve exposing yourself in front of a room full of people? !